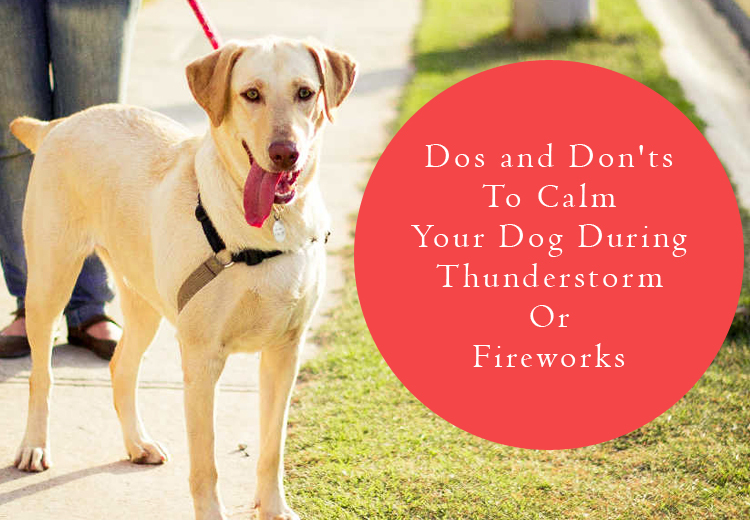 Is your pet scared with the noises like thunderstorms or fireworks? If so, he is not the only pet to turn into a scared dog when loud noises takes place. There are many dogs which get affected to the blaring sound created by fireworks which can be exciting to humans but frightening to dogs. In such cases, pet owners need to plan ahead, how to keep their dog safe? For the same thing, here are some dos and don’ts to minimize your pooch’s levels of stress as follows. You can try to acclimatize your dog to noises. There are many CDs, which are available in the market for your doggy, to give the opportunity to introduce him to all varieties of disturbing noises in a controlled manner. You can create a safe place for your dog, for example a sound proof room without windows to retreat, when he feels scared. Alternate to this, you can allow your dog to take refuge under the furniture and give him your unwashed cloth, so that he can smell your scent and feel comfortable. You can even try to distract your pooch by playing with him. Try rolling a ball to him to retrieve or playing fetch games with his favorite toy. Alternate to this, you can even switch on the TV, radio, or classical music; which is specially made for dogs. You need to be calm and act normal, as your dog can pick up any odd behavior. Remain happy and cheerful as this will send positive signals to your dog. Praise and reward your pooch with the treat for the calm behavior. Make sure, to put on a collar and ID tag on your dog with your updated contact details. You can even attach a microchip on his collar, so that you know where is he, if anything worst happens and your pup goes missing. Make necessary arrangement of dog stuff and dog supplies to safe guard your furry pal during celebration. Trying to take your dog to a firework or at noisy place, even if your dog does not bark or whimper, don’t think he is happy. If your pooch is excessively yawning and panting, this can be an indication that he is stressed. Keeping him in a crate when a noise takes place such as a thunder storm or fireworks; he may harm himself by biting or chewing. Making or forcing your dog to face his fears by doing this you will make him more frightened. Don’t forget to fill the bowl with water. Your dog may pant and get more thirsty, when he is anxious. Be kind and patient with your furry pal throughout the thunderstorm or fireworks. Try different ways to calm him without adding to his panic. If he wants to be with you, allow him to be with you, If he is following you from room to room, just go with it. By allowing him to do this you are providing him comfort that he needs to come out from the disturbance of loud noises.